Apple is bringing back the iPad Air to further expand the iPad line-up. The Cupertino, California-based company on Monday unveiled the new 10.5-inch iPad Air as well as an upgraded iPad mini model that will succeed the company's existing iPad mini 4. The company has ditched the numbers from the branding and is simply calling the new models as the new iPad Air and the new iPad mini respectively. 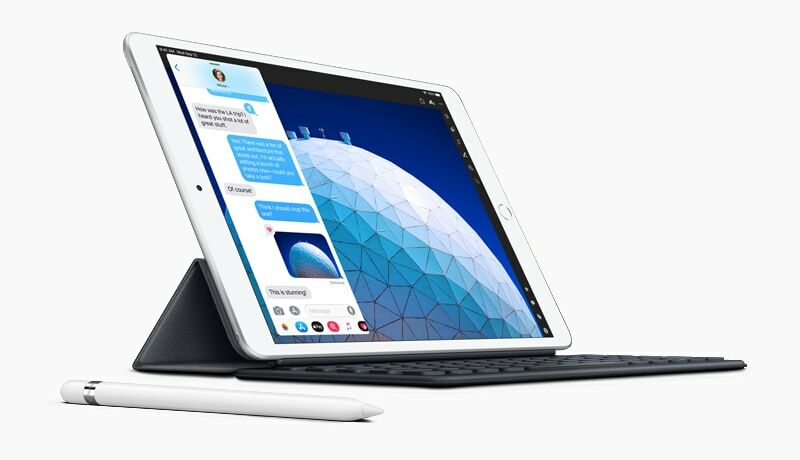 According to the Cupertino-based company, the new iPad models packs the A12 Bionic chip, an advanced Retina display, and support for Apple Pencil. The iPad (2018) and both iPad Pro models will continue to be available, however the iPad mini 4 seems to have been axed. iPad Air (2019) price starts at $499 for the Wi-Fi only model, whereas the Wi-Fi + Cellular model will retail starting $629. The iPad mini starts at $399 for the Wi-Fi only model and the Wi-Fi + Cellular model will be sold starting at $529. In India, the Wi-Fi only iPad Air has been priced starting at Rs. 44,900 and the Wi-Fi + Cellular version of iPad Air will retail at Rs. 55,900. The iPad mini pricing starts at Rs. 34,900 for the Wi-Fi only model and at Rs. 45,900 for the Wi-Fi + Cellular model. Both iPad Air and iPad mini will be offered in silver, space grey, and gold colours in 64GB and 256GB storage configurations. Apple says the new iPad Air and iPad mini models are now available for orders in 27 countries via Apple.com and Apple Store app. Some of the major markets that are getting the upgraded iPad models are US, UK, Germany, Australia, Canada, Singapore, Italy, and Japan. The new iPad models will be reaching to India “soon”, though the company yet to reveal a specific release date. iPad Air (2019) is coming to India "soon"
In terms of the specifications, the iPad Air (2019) packs a 10.5-inch LED-backlit Retina display with 1668x2224 pixels resolution. It is powered by A12 Bionic chip, which is also present in the company's iPhone XS and iPhone XS Max smartphones. For imaging, the company has included an 8-megapixel f/2.4 rear camera on the tablet with five-elements lens, but there is no flash. There is a 7-megapixel front shooter as well on the device with Retina flash support. On the connectivity front, the iPad Air packs Wi-Fi 802.11ac (Wi-Fi 5), Bluetooth 5.0, and optional LTE support. Face ID is not present, but the company has include Touch ID support. On the other hand, new iPad mini includes a 7.9-inch LED-backlit Retina display with 1536x2048 pixels resolution. Rest of the specifications of the device seem to identical to the iPad Air. The company says the Apple Pencil (First Generation, which is compatible with the original iPad Pro models and the iPad 2018) will be sold separately for $99 (Rs. 8,500 in India). The Smart Keyboard for the iPad Air will be offered at $159 (Rs. 13,900 in India). Additionally, Apple will also sell Polyurethane Smart Covers for both iPad Air and iPad mini, which will retail at $39 (Rs. 3500 in India) for iPad mini and at $49 (Rs. 3700 in India) for iPad Air in charcoal grey, white, pink sand and a new papaya, with additional Leather Smart Covers available for iPad Air in black, saddle brown, midnight blue, and red at $69.